Find Mass Nearest You; enter zip code. --Mass of the Lord’s Supper: You are invited to participate in washing of the feet during the Mass of the Last Supper at 7:00 pm. --PLEASE NOTE: The Parish Office will be closed on Good Friday, April 19th. --FORMED – The Augustine Institute’s new series for high schoolers is now on FORMED - Why believe? Answers to Life’s Questions. *A year-long apologetics course designed for the seekers of today, Why Believe? Delivers a clear defense of the faith in a format that appeals to our contemporary desire for beauty. This consists of 60 short form videos (now available on FORMED!). 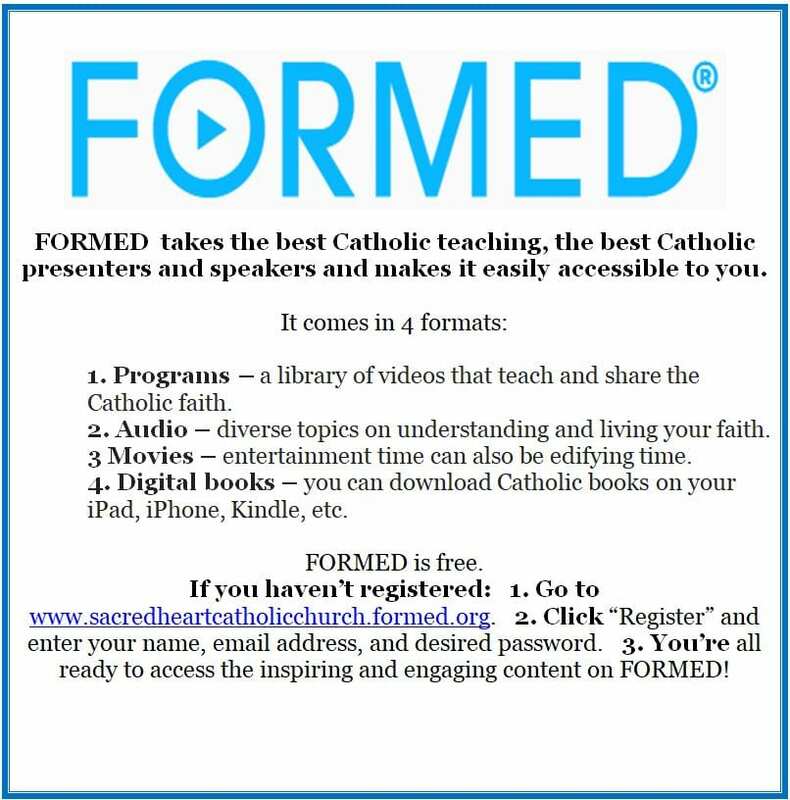 FORMED is a free service available to you through Sacred Heart. --DAY OF FAST AND ABSTINENCE – You are reminded of the church's laws for fast and abstinence: Good Friday is a day of fasting. Catholics between the ages of 18 and 59 are permitted one full meal and two lesser meals per day, with no eating between meals. Good Friday is also a day of abstinence. Catholics who are 14 years or older should abstain from meat entirely. Soups and gravies made from meat are permitted. --RELIGIOUS EDUCATION: *No Religious Education Classes Wednesday, April 17th, Sunday, April 21st, and Wednesday, April 24th. (Holy Week and Easter Week). *First Communion will be celebrated at the 5:30 pm Mass on Saturday, April 27th and the 8:00 am and 10:30 am Masses on Sunday, April 28th. *Seder Meal– During Holy Week – Wednesday, April 17, 2019. Speaking parts for teens/tweens available. Please arrive at 5:30 pm for “set up” of meal and stay for cleanup after meal if able (probably until 8:00 pm). This is an evening of *service. 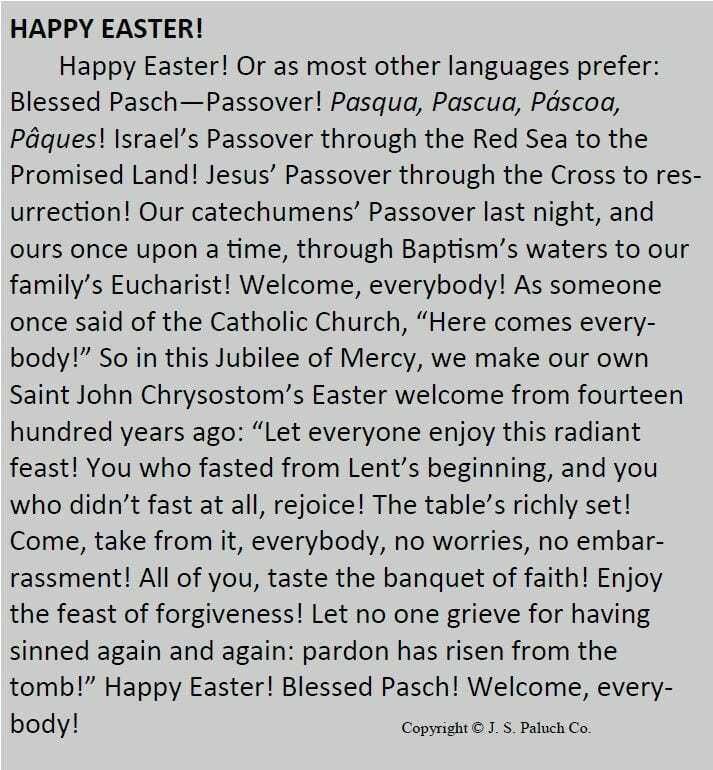 *Parishioners will arrive for Seder Meal at 6 pm. Parents and siblings are encouraged to attend. --SHEEP (Sacred Heart Early Education Program) will meet tomorrow, Monday, April 15th, at 9:15 am in the Activity Center. --CONFIRMATION RETREAT – All students must attend the Retreat on Saturday, April 27th. They also need to ensure that they have everything completed for the upcoming Retreat and the Confirmation Mass on May 19th. (Some permission slips are still missing). Parents need to drop off their candidate by 8:15 am at Marywood Retreat Center, and then be back by 8:30 pm for pick up. Friendly reminder for those attending the Retreat: No Electronic device will be allowed this includes cell phones, IPhone, IPad etc. If there is an emergency or a candidate needs to be contacted, the adults will have cell phones available for use and contact. Also, I have been notified by other Churches that we are one of the last retreats available, so if you cannot make ours you need to notify Sandra Curtis at the office immediately. 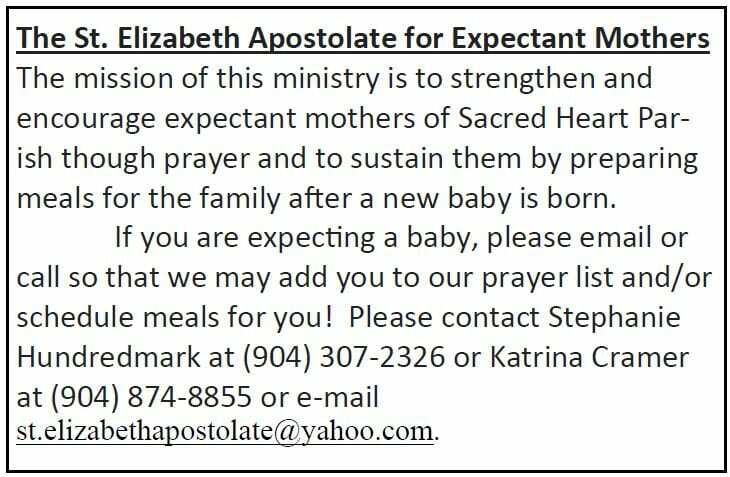 For more information please contact Sandra Curtis @ 904-284-9983. --Dear Parishioners, - On Wednesday, April 17, you are cordially invited to our Sacred Heart Holy Week – Seder Meal. A Seder Meal is a re-enactment of the Passover meal, filled with Judeo-Christian tradition. It is based on the meal Jesus shared with His disciples, The Last Supper. What a wonderful way to take part in Holy Week observances. It will take place in the Activity Center from 6:00 pm – 7:30 pm. 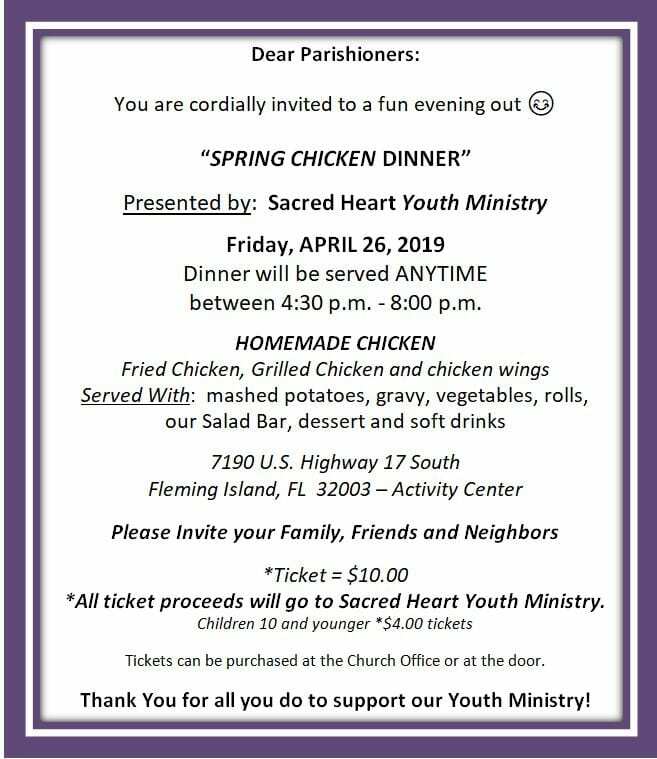 If you have any questions, please contact janice.schubert@sacredheartcatholicchurch.org or 284-3811 x205 for information. --THE STORY OF OUR REDEMPTION – We begin the final week of Lent with these familiar readings. This year, we hear the Passion from the Gospel of Luke. These readings for Palm Sunday and the Passion used to be read on successive Sundays. Now they are combined into a single feast, so that we may see the whole sweep of the glory and the suffering played out. Jesus accepts the adulation of the crowd, the foreshadowing of his glory in the Resurrection. He bids farewell to his disciples in his last Passover, and forgives his tormentors as he dies on the cross. Later this week, we enter the Holy Triduum of Holy Thursday, Good Friday, and Holy Saturday, when the whole story of our redemption will play out once again. 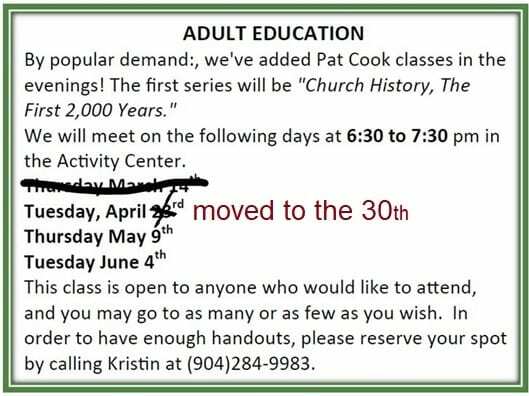 Copyright © J. S. Paluch Co., Inc.
--CAST (Catholic Adults Seeking Truth) will meet on April 16th, from 6-8:00 pm in the Activity Center. --There is no Bible Study on Wednesday, April 17th, because of the Chrism Mass at the Basilica. --CHRISM MASS – The annual blessing of the oils for use in the sacraments of Baptism, Confirmation and Anointing of the Sick takes place at the cathedral the week before Easter. In the St. Augustine diocese it is on Wednesday of Holy Week at 11:00 am. At Mass the bishop blesses vessels filled with olive oil. One has a fragrance added to it for the Chrism oil used in Confirmation. The oils are taken back to the parishes for use all year long. It is customary for Catechumens and Candidates to present the oils at the Holy Thursday Mass. --Congratulations to Jared De Leo, Anthony Hamaty, Chris Knight, Clay Ludwig, and Mason Wiggins, from our Diocese who were recently ordained to the transitional diaconate. Please pray for our newly ordained deacons! --PARISH WEBSITE – Be in the know… check out our website at www.sacredheartcatholicchurch.org. 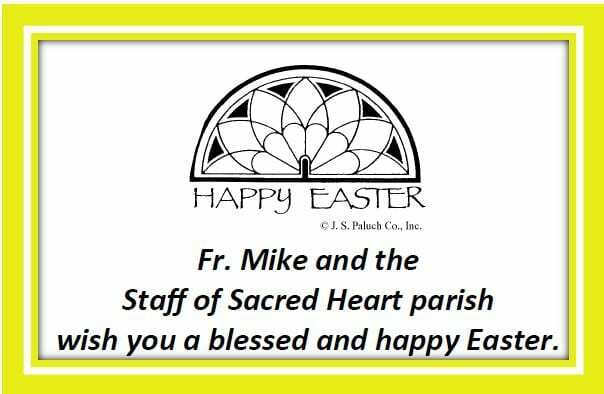 Contact Parish Office at 284-3811 or email bulletin@sacredheartcatholicchurch.org if you have something for the website. --Download our app today at myParishapp.com or search your phone's app store for myParish. --Exercise Classes for People with Parkinson's disease AND their Caregivers; Mondays and Thursdays at 9:30 am and this Monday at 6:00 pm in Building C.
--Thank you to all who have been recycling aluminum cans. This is now a project of Boy Scout Troop 309, who will be using the profit to fund Scout projects and activities. Please no tin cans, boxes or plastic bottles! Names will be printed in the bulletin for four weeks, and then removed; unless re-added by request. Please call with names you would like to have included on our list. Thank you for helping us to keep our list current. Jere Cook, Marge Merrit, Patrick Robichaud, Vivian Shepherd, Oliver Stefonek, our prayer blanket recipients, our homebound parishioners, those in the hospital, those in care facilities, and all those in our Parish and community that are in need of healing (physical and/or spiritual). We extend a warm welcome to those who attend our Church. We hope that you will find our parish community a place where your life of faith will be nourished. We also hope that you will share your special gifts within the community. Your prayers, your presence and your talents are most welcome. Parish registration forms are in the back of the church or may be obtained at the Parish Office. Sacred Heart Church began in 1874. By 1945, when the Navy came to Lee Field, the Mass schedule increased from 3 to 5 Masses which ended up being held at the Clay Theatre in Green Cove Springs because the church started to fall apart. May 1946 ground broke for the greatly needed new church; on land adjacent to the old church. Navy Personnel volunteered their labor toward the building of the new church; and the old church was being used as a parish hall and classroom where Sunday school classes and children's choir were being held. In 1994, Fr. Donal Sullivan, a native of Ireland, was appointed pastor of Sacred Heart. In 1999, work began to build another new sanctuary to accommodate the growing Catholic population. 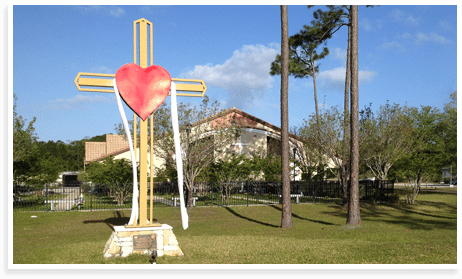 The new Sacred Heart located at 7190 State Highway 17 in Fleming Island was built and on May 13, 2001 the dedication was presided over by Bishop John J. Snyder. 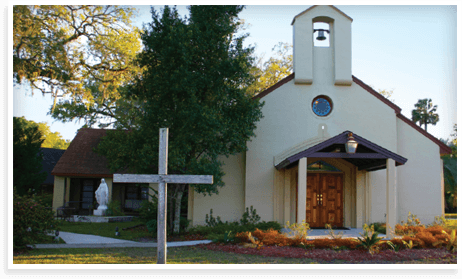 Compelled by the Gospel we the parish family of Sacred Heart, promote and support Christian Life by serving our parish and community through the celebration of the sacraments, educational programs, and other parish ministries. The celebration of Mass is an act of the whole assembly gathered for worship. In the Mass, the Church is joined to the action of Christ. We are joined to this divine action through Baptism, which incorporates us into the risen Christ. You will find Mass schedules for ordinary time and holidays and Mass Readings for the particular day from United States Conference of Catholic Bishops website. Stewardship is a way of life. For Christians who follow in the way of the Lord Jesus, stewardship is an expression of discipleship. When we recognize that God is the origin of all life, the giver of everything that we have and are, and the source of our freedom and giftedness; the healthy person responds by thanking God through prayer, by serving God and God's people through ministry, and by sharing our financial resources with those in need. Stewardship is a way of life based upon conversion of heart. Links to other sites around the Diocese.